New York, NY (Mar. 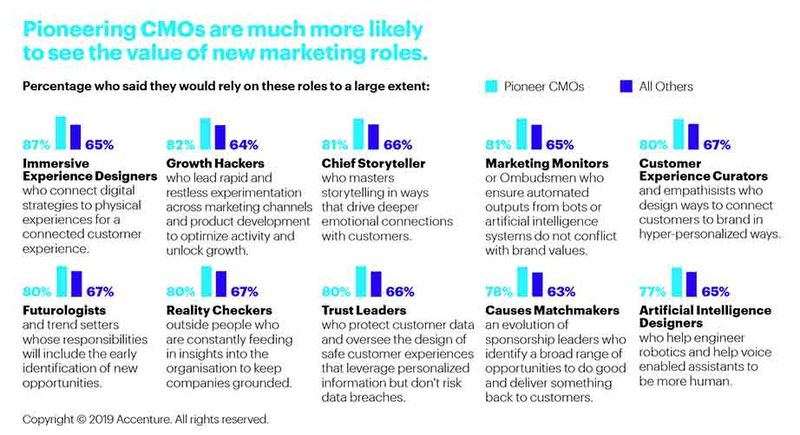 27, 2019) – A small number of innovative chief marketing officers (CMOs) are helping their organizations generate shareholder returns 11 percent higher than those of their industry peers by delivering hyper-relevant customer experiences, according to a new report from Accenture. Based on a survey of nearly 1,000 CMOs and more than 500 CEOs at the world’s largest organizations, the report — Way Beyond Marketing: The Rise of The Hyper-Relevant CMO — found that these marketing leaders — the top 17 percent — are driving transformational change at the highest levels of their organizations, helping them respond quickly to changing customer needs by rewiring their organizations to enable better integration and collaboration and deliver superior customer experiences. To find out more about the report, visit www.accenture.com/CMOInsights. As part of a study exploring the CMO’s role in driving the growth agenda, Accenture surveyed 935 chief marketing officers and 564 CEOs across 17 industry groups in 12 countries: Australia, Brazil, Canada, China, France, Germany, Italy, Japan, Singapore, Spain, the United Kingdom and the United States. Participants from the survey, conducted between March and May 2018, were from companies with at least US$500 million in annual revenues. Accenture (NYSE: ACN) is a leading global professional services company, providing a broad range of services and solutions in strategy, consulting, digital, technology and operations. Combining unmatched experience and specialized skills across more than 40 industries and all business functions — underpinned by the world’s largest delivery network — Accenture works at the intersection of business and technology to help clients improve their performance and create sustainable value for their stakeholders. With 469,000 people serving clients in more than 120 countries, Accenture drives innovation to improve the way the world works and lives. Visit us at www.accenture.com.